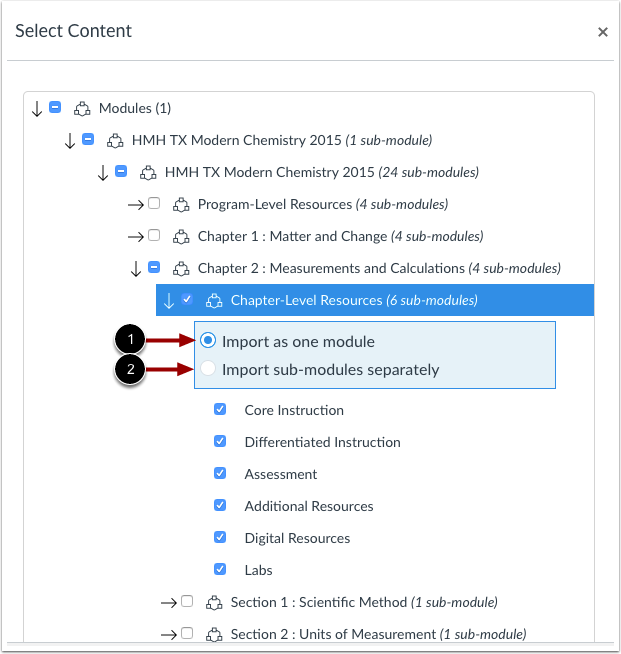 If your institution uses Thin Common Cartridge files, you can use the select specific content option in course imports to import content as separate modules. Thin Common Cartridge is a subset of the full Common Cartridge specification. Selecting content in a Thin Common Cartridge file is structured differently than other import types. Thin Common Cartridge is a lightweight metadata structure most commonly used by K12 institutions that allows publishers to provide digital resources using LTI links (external tools), which usually contains a significant number of resources in one common cartridge interchange file (.imscc). Thin Common Cartridge files are designed by creating items grouped into a folder or series of folders that defines how the content should be organized for the learner. When importing Thin Common Cartridge files, Canvas uses metadata identifiers and titles to simulate the hierarchical structure within the Thin Common Cartridge file. 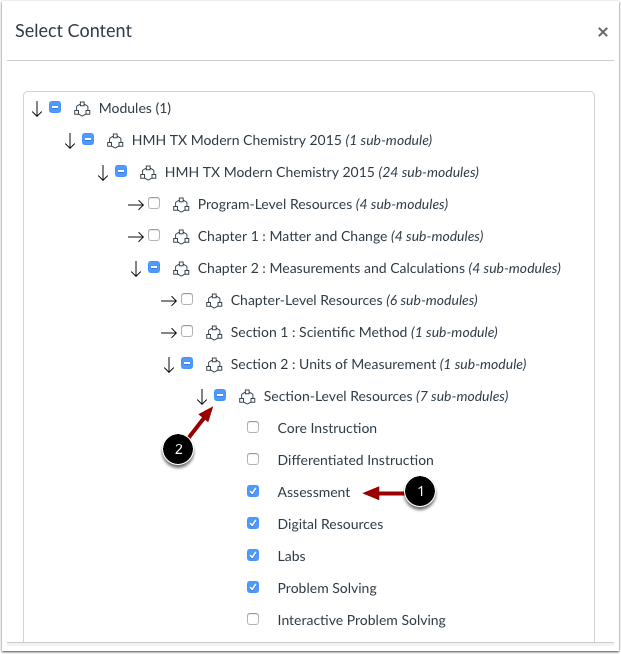 This structure appears as nested content within the Modules content heading, allowing users to view a structured organization and locate the content they want to import into the course. By default, grouped content is imported as one module, but they can also be imported as separate modules. Individual content within a content group is automatically imported as separate modules. In the Content Type drop-down menu, select the Common Cartridge 1.x Package option. Complete any additional fields required for the content. Thin Common Cartridge files are shown as one module. 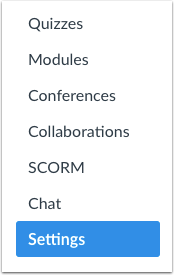 Click the Modules expand icon. Locate the content by expanding the nested structure. Content groups show the number of items within the group . If you want to import an entire content group, select the checkbox next to the group . 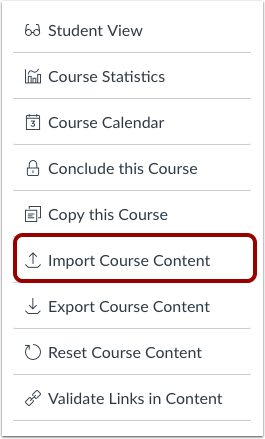 Like other course import types, selecting a content group selects all items within the module group. However, Thin Common Cartridge content is always imported as one module, which can be extremely cumbersome in a Canvas course. By default, content is imported as one module . If you would rather import content as separate modules, click the Import sub-modules separately radio button . Note: If you want to import several content groups as separate modules, module settings are applied on a per-content-group basis, meaning you must fully expand each content group and specify the separate modules option. Otherwise, all selected content in the hierarchy will always be imported as one module. To import only a few items from a content group, select the specific items to be imported . Canvas places a dash in the content group checkbox , indicating not all items are selected within the group. Selecting individual content items automatically imports content as separate modules. The Current Jobs section displays the status of your import. The import displays a menu bar with the time remaining to complete the import. 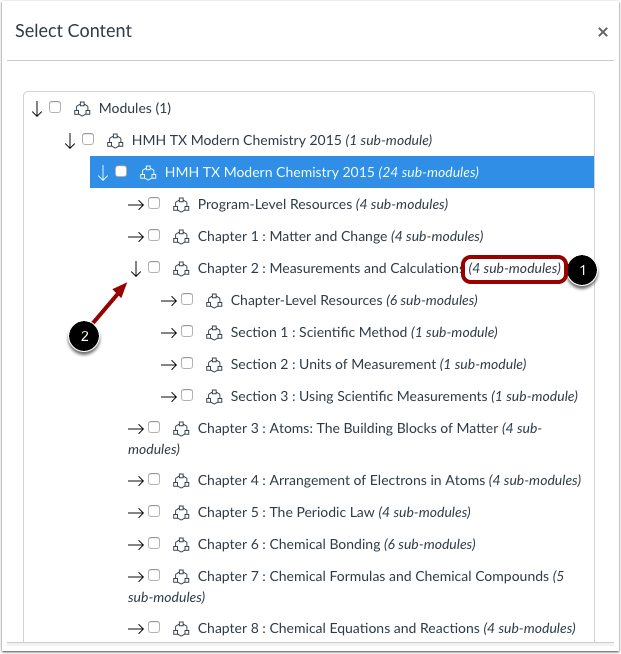 When the course has completed, view modules content by accessing the Modules link in Course Navigation. 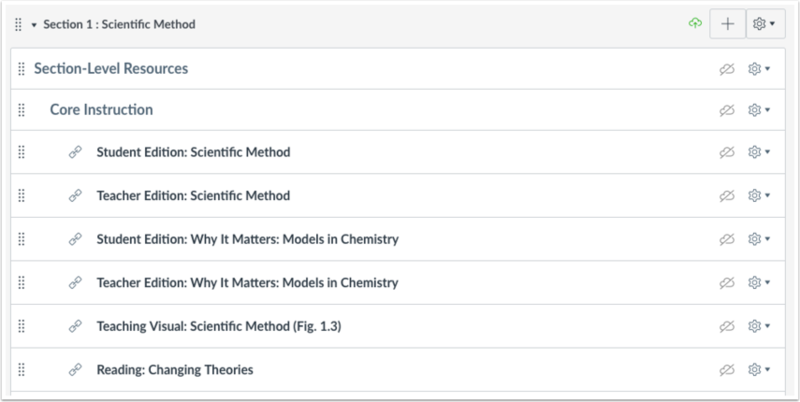 View the modules content in your course, either as one module or separate modules. Previous Topic:How do I select specific content as part of a course import? Next Topic:How do I adjust events and due dates in a course import? Table of Contents > Course Import Tool > How do I import Thin Common Cartridge files as separate modules?